Do you remember when you were younger and your mum nagged you every day to make your bed? You also probably remember all the excuses you had for not doing it – you are going to mess it up again, you cannot tuck in the sheets because your bed is pushed against the wall, or you do not have time. It is easy to come up with excuses, but so is making your bed, if you think about it. All you have to do is fluff up your pillows quickly, and straighten out your sheets and comforter, and voila! Your entire bedroom instantly looks neat and tidy. Apart from this, there are many benefits to making your bed every day. You start off your day the right way: During his speech on graduation day at the University of Texas in 2014, Naval Admiral William McRaven, said that you accomplish the first task of the day when you make your bed each morning, giving you a sense of accomplishment and pride. This will set the tone for the rest of your day, encouraging you to perform other tasks throughout the day. At the end of the day, you will have done a lot more, starting from the simple task of bed making. 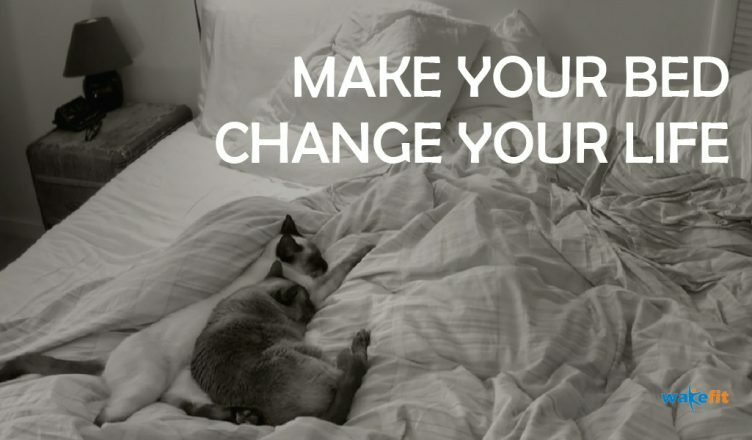 This shows that when you make the bed every day, it can help you start your day on a positive note and make you feel motivated and self-confident. It cultivates self-discipline: Also known as mental discipline, self-discipline is developed when you overcome physical and mental resistance. When you wake up, especially on Monday mornings, making your bed is sometimes the last thing you want to do. While it is understandable that you feel this way, it is a great opportunity to get over that feeling and discipline yourself. Your body and brain might resist your efforts, but it is possible to engage your mind at will and bring its attention gently back under control. 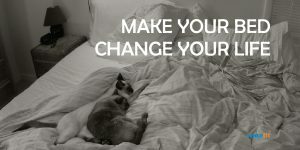 This way, you use your mind to focus on one thing and one thing only, which is the task at hand, i.e., making your bed. You want to make your bedroom tidy: With an unmade bed, even the most beautiful and well-organized bedroom looks messy. A made bed helps the rest of the room look much better, even if it is not perfect. Once you make your bed and are in the habit of doing so, it is more than likely that you will feel inspired to improve the appearance of your bedroom, even if it is in small ways. Once you are used to having a neat and tidy bedroom, you will start making your bed every day and make sure that your bedroom, which is your very own space, is always clean and well-kept. It improves your mood and lowers stress: You spend the most time in your bedroom – roughly one-third of your life is spent sleeping. So, the appearance of your bedroom affects your mood. When you are in a disorganized room, it is hard to feel relaxed, calm, and grounded. With a bed that is properly made, the entire room instantly looks pulled together, and this in turn creates a subtle vibe of peace and tranquility as well as competence. When you make your bed, it shows that you care about your home as well as yourself, and that feeling will help in relieving stress and lifting your mood. Bed making is a simple task that many people dread and often ignore. If you are one of these people, it is time to start a habit of making your bed every day. As you can see, there are many benefits to doing this simple task. Remember that there is no perfect or best way to make your bed – all you need to do is make sure that it looks neat.